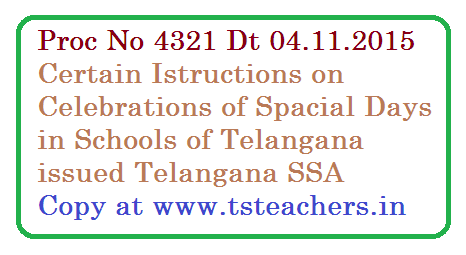 Proc.Rc.No.4321/CMO/T8/2015, Dt:28.10.2015 TSSA Hyderabad – Community Mobilization Wing – Celebration of Special Days in the School for creating awareness to the students – Calendar of Special Days Communicated – Certain Circular Instructions – Issued – Reg. It is the common practice in the schools to celebrate the National Days like Republic Day, Independence Day etc. These celebrations are aimed to create awareness and inculcate national sprit into the tender minds of the students. On the same lines, there are some other National/International Days of importance celebrating all over the world. There is a need to celebrate these special days also in the schools to acquaint the students with various aspects, by which it is possible to mould the student to attain the goal of comprehensive personality. The following are the Special Days to be celebrated in the month of November, 2015 in the Schools for the purpose mentioned above. Further, it is directed that, these Special Days should be celebrated with the involvement of SMCs concerned and without effecting the Regular academic programme.